On Wendesday, we attended the Open House night at our daughter's STEAM school. It was a bittersweet experience - knowing that it's the last Open House at this school, hearing teachers saying how much they will miss our daughter and looking at all the fun projects that students were working on this year. I want to share some of the highlights from Smarty's work in this post. 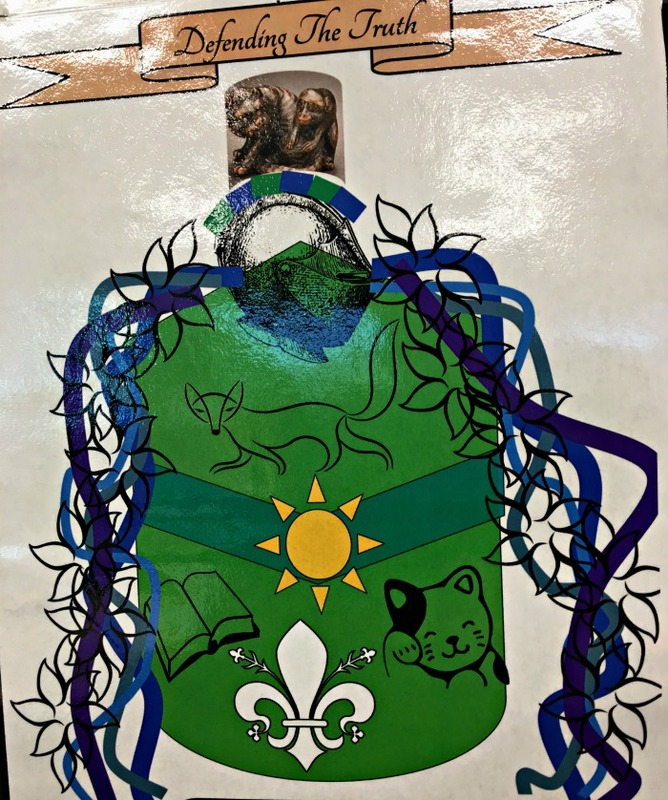 In the beginning of the year, each student designed their own medieval shield reflecting their interests and personality. They also needed to choose a motto. It was fun to see Smarty's shield during the Open House - Defending the Truth motto reflects her personality quite well. Smarty is really enjoying her art elective this term. Not only does she have an outlet for her creativity, but she is also learning some neat art techniques. In her own assessment, art and social studies were two subjects where she learned most new things this year. Smarty adored her new science teacher, a biology PhD, but, sadly, science was her least favorite subject this year. She was complaining that the class is moving too slowly and that she is rarely called to answer questions. The teacher actually talked to her about it early in the year and explained that she needs to know what other students know too. Anyway, all students did a project in groups on plate tectonics. Smarty's group had several organized and artistic girls, so their final output looked quite impressive during the Open House night. 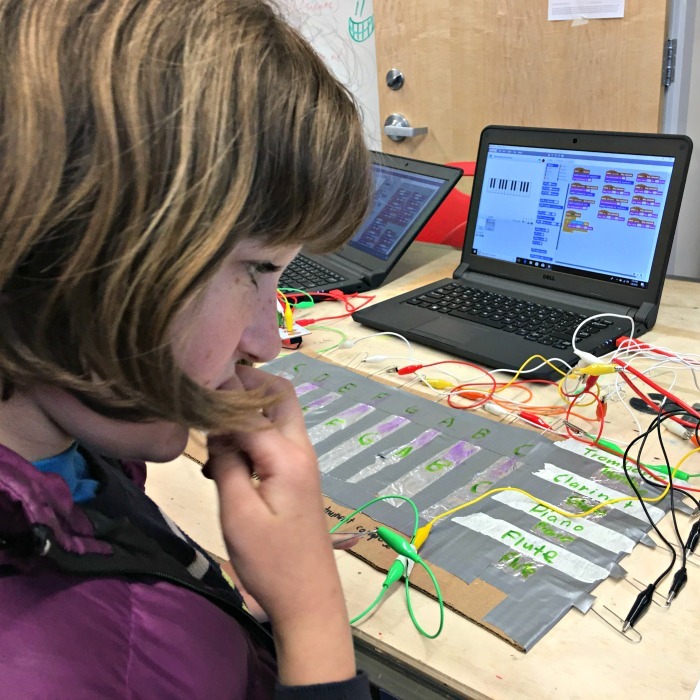 Maker's Lab is an official subject in Smarty's school - this year students did aero engineering projects, MBot robots, and, this term they were creating things with Makey-Makey. Smarty with her teammate was the only group that managed to get their Makey-Makey to a working stage - they made a flat musical instrument simulating different instruments. 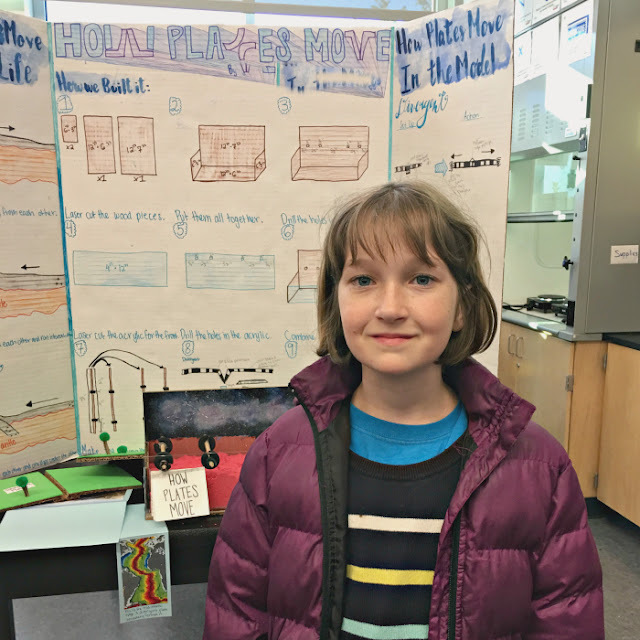 It's funny that she is so successful in Maker's Lab even though she says that she does not care for this subject, has no regrets of not having it in her future school and has no intention of becoming an engineer of any kind. 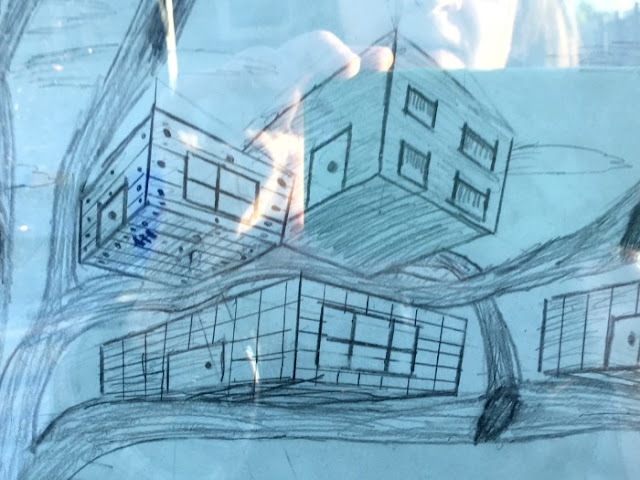 Seeing all the hustle and bustle of the Open House made me think how much we will be missing many aspects of this school - its dedicated teachers, some parent friends, and funny, thoughtful, and creative kids. Smarty's school is a fun school and a safe school. Who knows how her private school will turn out to be. But I still think we should take a risk, because Smarty is the one wanting to go. She is the one wanting more challenge, more learning, more engagement, and even higher expectations. I really hope that her new school will give her all that and that she will be able to make friends there - something that does not come easily to her. I wish we had a crystal ball to know what future will hold, but in the meantime we will be going boldly into the unknown. What projects were your kids involved in this year? 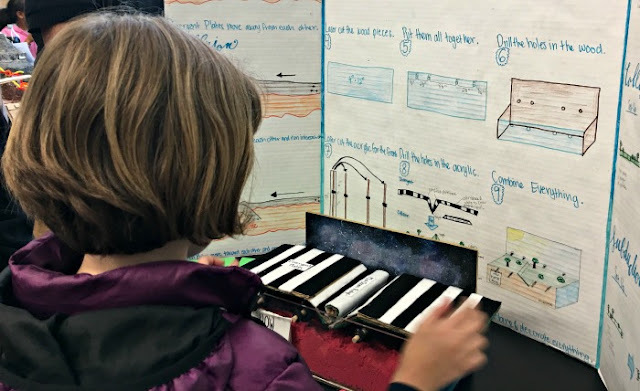 Looks like wonderful projects and a great deal of learning! Keep in mind that no matter where she goes, there will be pros and cons. It all depends on what you are looking for. For us this year, it was all about making new friends, working in groups with other students, and taking the initiative to stretch out of one's comfort zones. We didn't expect academic rigor but surprisingly, K learned a lot this year. We've been fortunate to have many wonderful teachers. It looks like Open House was really amazing again this year. 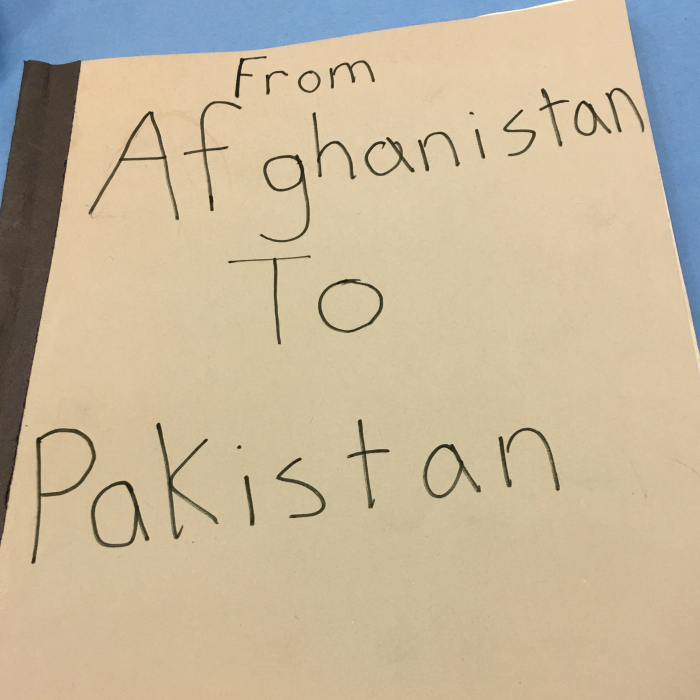 It was interesting to see how all of the different classes ended up with their projects. I am totally the same with how I do for a presentation of projects with Smarty and how her writing came out. I do great starting and then get to the end and miss on the little details. 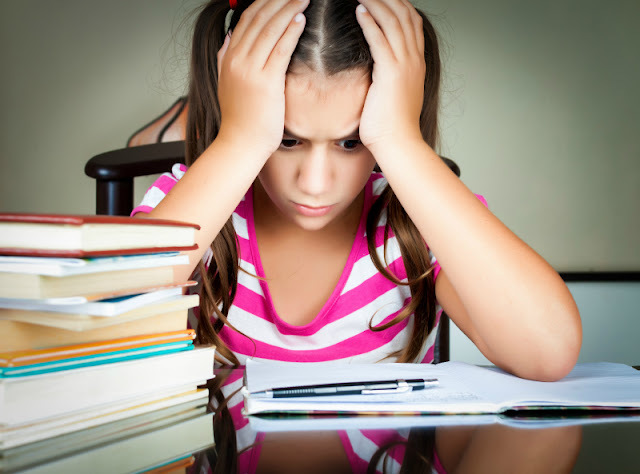 Why Are We Afraid to Let Kids Fail?